A center channel which is the piece that sits either above or below the TV. Two front speakers both right and left. Two to seven surround speakers. There are three types of such speakers namely; bipolar, dipolar and direct radiating monopole speakers with each type producing unique surround sound effects as discussed below. Bipolar surround speakers as denoted by the prefix ‘bi’ which means two, consists of two speakers that produces sound from both ends of the speaker cabinet. Bipolar speakers can be used as both side and rear surround speakers and each have a different sound effects. When used as side speakers, the sound is directed towards the front and back of the room. On the hand, when they are used as rear speakers sound is only directed along the back wall. In bipolar speakers, the front speakers are ‘in-phase’ which means that they work simultaneously and output sound at the same time. In addition, they diffuse the sound in a such way that the location of the speaker cannot be spotted. Most surround speakers are normally positioned at or above the ear level. However, for other setup like a movie setup they can be placed two to three feet above the ear level for maximum output. Bipolar speakers are more flexible compared to dipolar speakers making their installation much easier and they can be installed on the rear or side walls. Both sides of the wall behind or above ear level. Hanging from the ceiling behind or above ear level. Above the ear level on the rear wall. The same setup can apply for 7.1 setup only that all the extra speakers are mounted on the back wall, above ear level. Dipolar speakers works in a similar way to that bipolar only that they are ‘out of phase’. This means that the front speakers work one at time. When one is outputting, the other one is not and the other way round. Dipole speakers normally have an empty space in front of them and it is in this empty area that the listener is supposed to sit. This empty area intensifies sound diffusion. Unlike in bipolar speakers where they are normally placed above or behind listener’s ear level, dipolar speakers are installed on the same level as the listener, hanging from the ceiling or the side walls in the 5.1 setup. The empty space is placed directly in front of the listener. Dipolar 7.1 setup have speakers which are labeled right and left so that the in-phase drivers will be pointing towards front of the room when placed on the sides. This is to prevent cancellation problems that that might occur by ensuring that they are in phase with the front speakers when out of phase drivers are facing each other. As the word suggest, they directly output sound in the direction of the listener. These speakers enable the sound effects in music, movies,and games to be heard. They are normally placed at the back or sides of the room. When been used as either side or rear surround speakers, direct-radiating monopole speakers should be positioned either behind or on the sides of the room. If the speakers are too close to the listeners when placed on the sides, they should not go beyond the intended listening position. Additionally, they shouldn’t be aimed directly at the listener’s head. On the same note, experimenting with speaker aiming should be done if they are placed several feet behind the listening position. Choosing one model over the other is solely an individual’s preference which is based on the experience expected. However, here are some key considerations to keep in mind. For movie lovers, the surround speakers shouldn’t divert or distract their attention away from the movie instead should make them even more glued and attracted to the movie. Additionally, both bipolar and dipolar speakers have the ability to diffuse sound in the entire room as such they are able to regenerate surrounding effects such as gunfights, explosions, or the sound of various animals at night in a way that the sound feel like it’s not just coming from where the speakers are positioned instead they should sound like they are coming from every part of the room. Bipolar and Dipolar speakers have a more defined and sweet surround spot than direct radiating ones. If you are looking for movie theatre experience bipolar and dipolar speakers provides an almost match to the arrays of surround speakers that you will find in a movie theatre. This is not possible with direct-radiating ones. A major advantage that direct-radiating models have over other model is that they have the ability to send sound directly towards the listener’s ears. They have a focused and clear diffusion pattern a characteristic that enables them generate in a precise manner all sound effects in soundtracks. Finally, how do you determine which surround speakers to use? As earlier stated, dipole speakers have the ability to turn everything into a spacious environment through its ability to diffuse sound effects irrespective of the original intended purpose. As such they are not ideal for those who want to achieve a small room effect as they always disperse much sound around which means they always sound voluminous.With that in mind, the following situations are appropriate to use dipolar speakers. When you want to achieve that voluminous and diffuse surround atmosphere and at the same time not able to easily identify where the sound is coming from. It was earlier indicated that dipolar speakers have an empty area created through diffusion of sound to the back and front of the room. It is in this empty space that the listener can get to enjoy the diffusion nature of the dipoles. As such dipoles should be used when you want to be enclosed fully in indirect sound. Bipolar speakers give you the ability to enjoy the sound effects of dipolar and direct-radiating speakers and of course without the shortcomings that comes with the two models. This means that it is possible to achieve the localized i.e. direct and close environment that comes with direct radiating monopole speakers and the wide, enclosing and voluminous atmosphere of dipolar speakers at the same time. Here the advantage of using bipoles over the other two models is that with bipolar speakers, they are not in your visibility as the direct radiating ones are and not as voluminous as dipolar speakers. 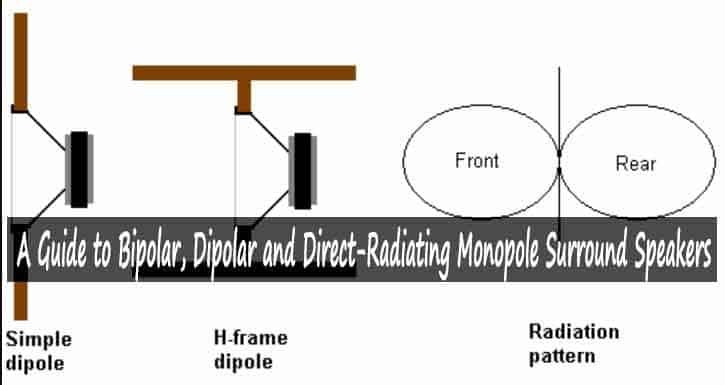 The installation of bipolar speakers is more flexible as compared to that of dipoles as they don’t have the base rolls found with the dipoles. The bipoles nature to work ‘in-phase’ makes them generate greater sound effects than the dipoles ‘out-of-phase’ configuration. This is especially important if you want to place the surround speakers away from your listening position that could be anywhere on the side walls or at the back of the room behind you. People who prefer distinct surround channels have the best choice in bipoles as their settings provides for channel separation as well as localization of the sound-scape. When you have the limitations to only install the surround speakers at the corners at the back of the room, then the direct radiating speakers comes in handy as both dipoles and bipoles, installing them too close to the side walls will interfere with their performance as they will shoot the sound directly into the walls. Monopole speakers are more appropriate if the area where the listener is supposed to sit is about 10 feet from the side or back walls where the surround speakers are to be mounted. In order to achieve a more diffuse effect, the speakers should be placed in a direction that is more to the front than to the listening space. If monopole speakers are to be used in larger rooms, then a number of surround speakers should be mounted on both the rear wall and side walls. The speakers should also be placed at a far distance from the listening area and apart from each other so as to achieve the highest degree of ‘directness’ i.e. more and more sound to be directed to the listening area.